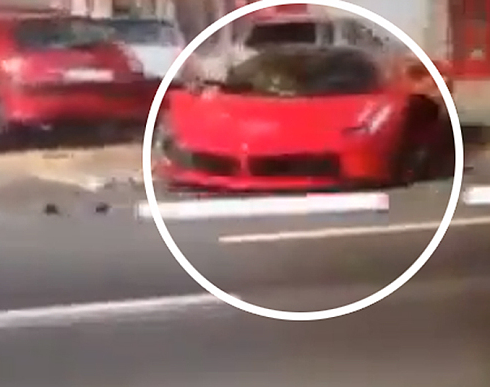 A man in Hungary who just bought a Ferrari wrecked the brand-new sports car just minutes after leaving the car dealership. A video shows the Ferrari, which cost more than £1 million (54.1 million baht), suddenly veering off the road and smashing into parked cars. It is not clear how the accident happened, but it appears that the driver was unprepared for car's enormous horsepower, and lost control of the car when he accelerated too hard trying to change lanes. Luckily, no one was injured in the accident. A man in Hungary who just bought a Ferrari wrecked the brand-new sports car just minutes after leaving the car dealership. A video shows the Ferrari, which cost more than £1 million (54.1 million baht), suddenly veering off the road and smashing into parked cars. It is not clear how the accident happened, but it appears that the driver was unprepared for car's enormous horsepower, and lost control of the car when he accelerated too hard trying to change lanes.